SportsCenter on the Road Spring Training Bus Tour Coverage Begins Saturday - ESPN Press Room U.S.
Monday, Feb. 20, the bus travels to the Cleveland Indians’ camp in Goodyear, Ariz. Crawford, Boone, Mendoza and Kurkjian will be providing insight and interviews throughout the day, including Kurkjian speaking with Indians’ manager Terry Francona. The tour moves to Florida beginning Saturday, Feb. 25. Crawford, Kurkjian, Mendoza and analyst Eduardo Perez will report from the Boston Red Sox camp in Fort Myers. Sunday, they travel to the New York Yankees’ Spring Training site in Tampa. SportsCenter anchor Randy Scott will visit five Spring Training sites in five days beginning Monday, Feb. 20, including the Washington Nationals, Baltimore Orioles, Pittsburgh Pirates, New York Mets and Red Sox. Scott will provide inside access and unique features with key players at each facility. Reporters, including Buster Olney, Marly Rivera, Michelle Steele, Gomez and others will continue on-site, in-depth coverage from Arizona and Florida throughout Spring Training. 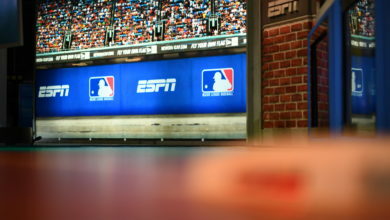 Spring Training segments will air throughout the day on SportsCenter. Telecasts are also available on WatchESPN and the ESPN App.